It was a life-changing event: the breadth of music, profundity, virtuosity and presentation elevated one to near-ecstasy. 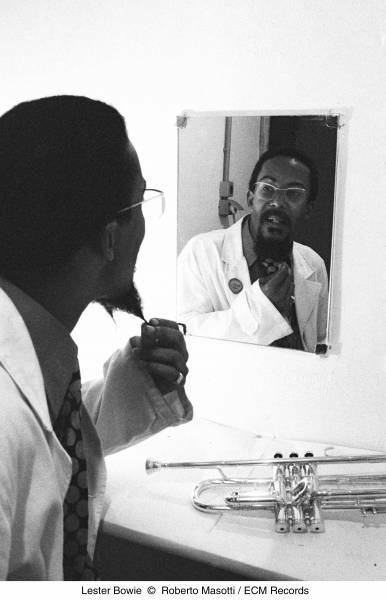 This was in 1980, the Art Ensemble of Chicago’s only Sydney concert. As sensational as their albums were, to encounter one of music’s most revolutionary entities live was to step through a musical looking-glass into another world. Before a note was played one was already floored by the countless instruments and striking costumes. 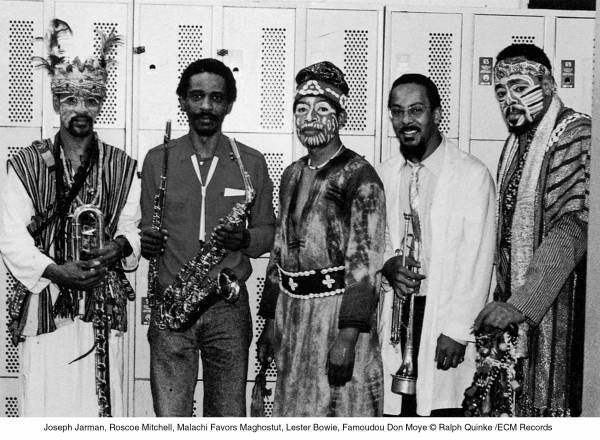 While saxophonist Roscoe Mitchell (the band’s founder) opted for humble street clothes, trumpeter Bowie (the joker in the pack) donned a white doctor’s coat, and saxophonist Joseph Jarman, bassist Malachi Favors Maghostut and drummer Famoudou Don Moye all wore elaborate African tribal attire and painted faces. A theatrical flourish that emphasised their African heritage, it was visual manifestation of their motto: “Great Black Music – ancient to the future”. All were multi-instrumentalists who punctuated their repertoire with drum chants which could be so melodic and harmonised as to be more like drum choirs. They formed with the specific intent of seeing how improvised music evolved if the same group cohered for decades. In the event they sustained the same personnel for 24 years, and the group has now existed in some guise for 50 years. This 21-disc treasure-trove (and 296-page book) contains the Art Ensemble’s five ECM albums (many having been recorded for other companies), plus four by Bowie and four courtesy of Mitchell’s bristling musical intelligence. Additional material includes Mitchell or Bowie in groups led by Wadada Leo Smith, Evan Parker or Jack DeJohnette, among them DeJohnette’s burning Made in Chicago. It becomes a grand history of African American music, via one stupendous band and its offshoots. 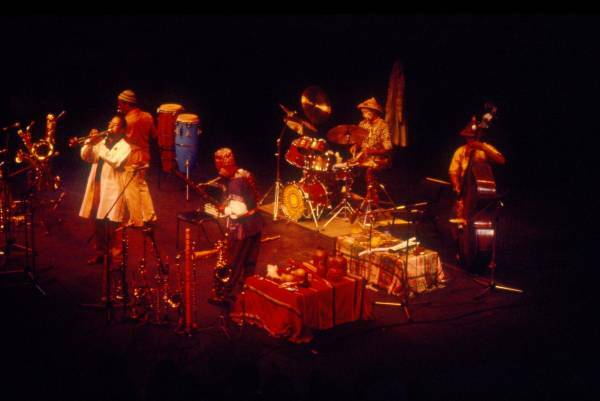 The Art Ensemble in full flight in Sydney’s York Theatre in 1980. Photo: Jane March. Nice Guys was their first on ECM, and producer Manfred Eicher’s widescreen stereo imaging and luxuriant reverberation presented the band’s many intricacies with a clarity very similar to their live aesthetic. The highlight was Jarman’s The Master, and this CD version contains the same thrilling dynamic range as the original vinyl, with the initial laidback saxophone riff and trumpet solo blown apart in a fireball of energy. In 1981 Bowie returned to Australia leading From the Root to the Source, a band even more intent on proving all African American music, from spirituals to free jazz, was one. The first concert was so mind-blowing I went every night (and, incidentally, interviewed Bowie – my first music journalism foray). The all-star band included two towering vocalists: soul diva Fontella Bass (Bowie’s ex-wife) and thrilling gospel singer David Peaston. A variation of this personnel recorded The Great Pretender under Bowie’s name, an album containing some of the trumpeter’s finest work – further proof that were there a correlation between artistry and fame, Bowie would be 10 times as renowned as that supreme technician, Wynton Marsalis. The album reaches from the title track’s classic soul to the goofy Howdy Doody Time and the desperately sad Rios Nigros, underpinned by Phillip Wilson’s brilliant drumming. Bowie’s next, All The Magic!, was at least as good, continuing to interweave the diverse strands of African American music with beauty, clarity and humour. A soulful tribute to Louis Armstrong cohabited with the free-jazz saxophonist Albert Ayler’s Ghosts and the rollicking R&B of Let the Good Times Roll. The masterpiece was Bernard Igher’s Everything Must Change, with Peaston’s singing exhausting what it is to be human and to feel. The AEC’s storming Full Force included Bowie’s irrepressible tribute to Mingus, Charlie M, and the next, Urban Bushman, a sizzling double live album recorded on the same tour that brought them to Australia, was followed by the beautiful The Third Decade. Who else combined larger-than-life musical personalities, rampant imagination, ritual, art music, African drumming, free improvisation and the entire gamut of jazz? In 1993 Jarman retired to concentrate on Buddhism, and in 1999 Bowie died. The remaining three members assembled to record Tribute to Lester, which includes the exquisite improvisation He Speaks to Me Often in Dreams. Subsequently Jarman returned, Favors died, and then Jarman died just a month ago. But the band continues, now an institution.